MSG - Making You Sicker and Fatter? You are here: Home / Natural Health / MSG – Making You Sicker and Fatter? MSG – Making You Sicker and Fatter? Where is MSG hiding in your food? This is sold as good, wholesome food. Boy, it sure looks a whole lot better if you don't read the ingredient list. We've got at least three forms of MSG (monosodium glutamate, soy protein concentrate, yeast extract), possibly up to five (dried whey, spice extract). We've also got genetically modified vegetable oils. 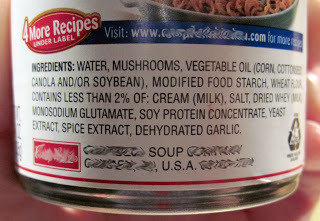 I was over at Food Renegade reading her post titled Why MSG is dangerous and where it is hiding, which got me started looking at MSG (Monosodium Glutamate). The MSG side effects I found were more than a little concerning. Have you ever felt “off” after eating Chinese takeout or other foods loaded with MSG? Advance Health Plan shares an interesting discussion of this phenomenon. To defend themselves against epidemiological studies indicating that 25-30 per cent of the population reacted to monosodium glutamate and against individual reports of human adverse reactions that included migraine headache, seizures, asthma, and depression, the glutamate industry built the fiction that a few people might react to monosodium glutamate with the “Chinese restaurant syndrome”: “burning,” “tightness,” and “numbness,” all occurring at the same time, within two hours following ingestion. They sent out a questionnaire and got 3,222 respondents, of whom 1.8 per cent reported having the exactly defined “Chinese restaurant syndrome.” The fact that an additional 41.2 per cent of the subjects reported experiencing conditions that are associated with MSG-induced adverse reactions such as headache, diarrhea, chest pain, dizziness, palpitation, weakness, nausea/vomiting, abdominal cramps, chills, heartburn, unusual thirst, unusual perspiration, flushing sensation in face or chest, and tingling was ignored. Migraine headache, seizures, tachycardia, hives, skin rash, and depression, which were not offered as options, were not considered. A 2011 study showed that MSG consumption directly correlates with weight gain. Researchers measured the the MSG consumption of more than 10,000 adults in China over the course of roughly 5.5 years, weighing each participant before and after they were tracked for the study. On average, those with the highest MSG intake were 30 percent more likely to become overweight by the end of the study than those who consumed the least of the flavoring agent. After excluding those who were overweight at the beginning of the study, that figure rose to 33 percent. Where is MSG used in food? Truthinlabeling.org has a very good list of food ingredients that serve as msg-reaction triggers. Here are the items they say ALWAYS contain MSG. They follow this up with an expansive explanation of still other ingredients in everything from personal care products to medications that may also trigger MSG reactions. It's crazy! I've been avoiding low fat dairy products for some time, but still – THIS IS REALLY FRUSTRATING! So many of the food on the shelf in the grocery store have this stuff it's almost impossible to avoid. My pantry has already radically transformed over the years. I guess it just keeps transforming. Want to learn more? Check out the book “Excitotoxins – The Taste That Kills” by Dr. Russell Blaylock. While Dr. Blaylock tends to be somewhat over the top at times for my personal preference, I feel that we need to increase awareness of the overuse of these substances, often to mask inferior quality ingredients. Crazy, isn't it, how many additives are in our food? A friend and I were talking about pyrophosphate in canned tuna, trying to figure out what it was. Apparently, it's used to keep crystals from forming in the tuna. Why would there be crystals in the tuna? How long do they expect that stuff to sit on the shelf? Ewww! I'd been suffering heart palpitations for years after I ate and I didn't know why. I wore heart monitors but 4 doctors didn’t know why some foods were causing the PVC’s. Now, after suffering frightening palpitations for 20 years, I finally discovered what it could be. Before, I didn’t know what it was in my meal that was causing it, but after eating a single can of Campbell's Minestrone soup recently, I went into severe heart arrhythmia. A light bulb went off in my head- “It’s not what I was eating, it was what was IN what I was eating: Monosodium Glutamate. Oh my gosh- after all these years, I began taking MSG out of my diet and guess what? The palpitations stopped. It’s simply poison to those who are sensitive to it. Campbell’s said, “No one has ever died from eating our soup,” and I said, “How do you know?” Really- with 50 of their products carrying the poison, I wonder how many people had a heart attack in the world after eating a can and no one ever figured it out? What if? What if I have been eating something that was poisoning me for 20 years and didn’t know it? What if it was the cause of my heart disease? And, how come I had to figure it out myself? Shouldn’t the medical industry know that MSG can cause these types of effects? I’m angered by the possibility that others are experiencing the same thing. Campbell’s is curious too. If you know of anyone, contact me at drmwvr111@yahoo.com. Together, maybe we can stop one companies use of a chemical that may have eventually killed me because I didn’t know I was sensitive to it. Wow – thanks for sharing your story. I've been wondering about this a lot since reading the interview with Dr. Blaylock. Several friends have been having heart pains since they've gotten older, and I can't help but wonder if there is some connection. I know it's all about selling more product. It just drives me nuts that the FDA hunts down retailers who post any health information about foods like coconut oil and cherry juice, yet they allow products that are poison to many (if not all) of us to be sold indiscriminately. Thanks for linking your great post to FAT TUESDAY. This was very interesting and very thorough! Hope to see you next week! I really really really appreciate this post. I am actively look at ingredients, but sometimes we still eat junk because we like pepperoni, deli meat, etc. But with this information in my mind now I just have to find an alternative to chemical filled meats. Yuck. Kristine – one step at a time. In a perfect world, we’d all eat nothing but modest amounts of grassfed/pastured critter – then there’s life. Start by cutting back, then work to cut out. MSG is really bad for you. I know that after I eat a lot of it, it makes me sick. I try to avoid it the best I can, but it really is in almost everything. Most fresh fruits and vegetables that haven’t been processed are MSG-free. Tomatoes, which naturally contain MSG, are the exception. Fruits and vegetables that have been fermented, such as kimchi, sauerkraut and some types of pickles, may contain MSG, so these are best avoided if you can’t tolerate MSG. Any canned or processed fruits and vegetables that have added seasonings or flavorings could have MSG, but those that just contain the fruit or vegetable don’t.